������ Yasothon is famous for its boisterous Rocket Festival every May,when giant home-made missiles are launched into the air in a symbolic rain-making gesture. In the town at Wat Mahathat,Phra That Yasothon is a much-visited Lao-style chedi,said to be over 1,200 years old. 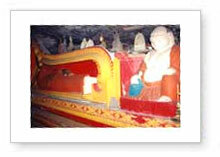 It enshrines holy relics of Phra Ananda,one of Lord Buddha's chief disciples. That Kong Khao Noi is an ancient Khmer chedi with a much revered brick and stucco Buddha that is ritually bathed every April. The handicraft village of Ban Si Than is famed for the triangular pillows used in most Thai households. Yasothon has an area of 4,161 square kilometres. It is divided into the following districts: Muang, Kham Khuean Kaeo, Maha Chana Chai, Pa Tio, Loeng Nok Tha, Kut Chum, Kho Wang, Sai Mun and Thai Charoen. From Bangkok, take Highway No. 1 to Saraburi and Highway No. 2 to Ban Phai, then take Highway No. 23 to Yasothon via Borabue and Maha Sarakham and Roi Et, a total distance of 531 kilometres. Bangkok-Yasothon buses depart from Mochit 2 Bus Terminal every day. Contact Transport Co.Ltd at Tel: 0 2936 2852-66 or visit www.transport.co.th for more information. There is no direct train running to Yasothon. Visitors can take a train to Ubon Ratchathani, then continue the trip by bus to Roi Et. Call 1690, 0 2223 7010-20 for more information. There is no direct flight to Yasothon. Visitors can fly from Bangkok to Ubon Ratchathani and continue the trip by bus to Yasothon. Situated in Wa Phra Phutthabat Yasothon, the hall enshrines the Lord Buddha's Footprint in the form of a white sand dune at the fertile ara of the Chi River. Wat Maha That is an important temple of the province in the town. The building of importance here is Phra That Yasothon or Phra That Anon, an ancient square pagoda with the top similar to that of Phra That Phanom. The architecture is in the Laotian style which was popular in the late Ayutthaya to early Rattanakosin periods. The pagoda houses the relics of Phra Anon. A state minister from Si Sattana Khanahut (Vientiane) who took migrants to settle here about 200 years ago constructed it around 1778. Another historical site within the compound is the scripture hall that is in the Isan art style. The doorway and the door are beautiful carved woods with exquisite lacquer designs. The designs on the walls show a mixture of art from the Central Region. Built during the reigns of Rama IV and Rama V of the Rattanakosin period, the hall stores scriptures on dried palm leaves and art objects from Vientiane. Phra That Kong Khao Noi is at Tambon Tat Thong. Take the Yasothon-Udon Thani route for 2 kilometres to get to the site. Built during the 23rd-25th Buddhist century in the late Ayutthaya period, the small, square brick pagoda has a distinctive top. The middle part has designs of doorways on all 4 sides. A brick wall surrounds the pagoda. A sacred Buddha image is behind the pagoda. Legend has it that it was built by a young farmer who was repentant after killing his mother because he was upset with hunger. Located at Ban Ngew, Tambon Ku Chan, 12 kms. from Amphoe Kham Khuen Kaeo, KuChan is an ancient pagoda similar to Phra That Phanom. Legend says it has been built in the same period to Phra That Phanom in Nakhon Phanom province. The significant attractions include Big Buddha Image, Pagodas, etc. Big Buddha Image. Made of brick, the principle Buddha of Wat Song Puey is 3 metres wide and 8 metres high. This sacred image can be dated back to more than 200 years. Pagodas containing soil from holy sites of Buddhism. The old pagoda, more than 200 years old, was renovated in 1955 by Field Marshal Plaek Pibulsongkram. It houses soil from holy site of Buddha, namely the place of birth, enlightenment, the first sermon, and nirvana, brought from India by a Buddhist monk, Khien Ammaphand. The replica of Buddha Footprint. The footprint was built by sponsoring of Field Marshal Plaek Pibulsongkram and his lady. Lots of local people come to bath the footprint During Songkran Festival. Antique Museum. The museum features antiques found from Dong Muang Toey, an ancient Khmer town. The antique include stone bed of the mayor, and stone inscription in ancient Khmer letter. Dong Muang Toey Ancient town.The remaining of ancient town Dong Muang Toey is found a kilometre south of Song Puey Village, 7 kms. from Amphoe Kham Khuen Kaeo. Foundation of temple, pond, and town wall are found. Altough they are ruined, their remaining indicated that it once was settlement in Chenla-Dhavaravadi period or in the 7th Centiry. Chenla King’s inscription indicated that this ancient site is religious place for Shivism. Dong Muang Toey and nearby community, proably satellite town of Chenla Kingdom, was called ‘Sangkha Pura’. Chenla Kingdom developed into Khmer Empire later and extended its territory into Moon and Chee River Basin during such period. Ban Khum Singha Tha, in Muang municipality, is the old area whose name is found in the city’s history. The area is rich of beautiful old-fashioned buildings which is well preserved, making a nice place to enjoy the cultural rich area. Hor Trai, or library of Wat Sra Trinurak. Hor Trai is located in Wat Sra Trinurak, Ban Na Wiang, Moo 1, Tambon Na Wiang, 25 kms. from Yasothon City. The ancient pavilion, over a century old, located amidst pond is housing Buddhist scriptures since ancient time. The Burmese-style wooden architecture is 8.30 metre wide and 10.50 metre long, with 4-level metal-sheet roof and long eaves at all sides. The front door is delicately carved. Ban Si Than is where typical pillows are made. The village is 20 kilometres from Yasothon on the way to Amnat Charoen. Villagers make Khit pillows and weave after the harvest is done. They are famous products of the province. Phaya Thaen is a rain god according to the belief of Isan people. Phaya Thaen Public Park is on Chaeng Sanit Road in the municipality. The large area is surrounded by a small waterway and is decorated with flowers and decorative plants. It also has a health park. The park is the venue of various provincial fairs like the Rocket Festival, the annual boat race and the Songkran Festival. Located in Ban Song Yae, Amphoe Thai Charoen. Initially, the church was a tiny hut, and it was rebuilt many times. This is the fourth church built in 1947 by wood contribution by the villagers. Built in Thai traditional style, the country’s biggest wooden church is 16 metres wide and 57 metres long. How to get there: From Yasothon, use highway 2169, turn left after passing Amphoe Kut Chum for 7-8 kms, and keep going for 600 metres. The school and the church share the compound. Located in Ban Song Yae, Amphoe Thai Charoen, the Catholic Church is actually called Father Dechanel is the first rector of the church. The church serves villagers of Ban Nong Song Yae, all of who are Catholics. Initially, the church was a tiny hut, and it was rebuilt many times. This is the fourth church built in 1947 by wood contribution by the villagers. Built in Thai traditional style, the country’s biggest wooden church is 16 metres wide and 57 metres long. It is made of 80,000 wooden roofs, 360 wooden piles in different sizes, floor made from huge pieces of Malabar ironwood and jamba timber, wooden benches which can accommodate over a thousand people. The 260 wooden piles in the middle row are the biggest, with over 10 metres long. The church bell, 2 feet long in diameters, is in bell tower in Thai style, but it is separated from the church. Huge amount of remaining wood is enough for building Ban Song Yae Pittaya School. How to get there: From Yasothon, use highway 2169, turn left after passing Amphoe Kud Chum for 7-8 kms, and keep going for 600 metres. The school and the church share the compound. History of Ban Song Yae Church. It was said that in 1908, five families sought a refuge in this area, this was lush jungle, after being hurted and evicted as they were blamed as zombie. They have met Father Dechanel and Ombrocio , Ban Se Song, Tambon Chiang Peng, Amphoe Pa Tiew of Yasothon, and asked them to get rid of devel in their bodies. After the success, they become Catholics. More people migrated to Ban Nong Song Yae. In 1909, a small hut was built for Catholic rites and that was the beginning of Song Yae Church. This is a natural beach formed by the receding water level in the Chi River in the dry season, which is never higher than 70 centimetres. The beach is nearly 2 kilometres long. Locals like to come here to relax and have a meal. ส่วนความเป็นมาและตำนานเกี่ยวกับบุญบั้งไฟมีหลายประการ ด้วยผู้รู้หลายท่านได้กล่าวไว้เช่น…สิริวัฒน์ คำวันสา ได้ให้ข้อสันนิษฐานเกี่ยวกับต้นเหตุความเป็นมาของประเพณีบุญบั้งไฟในแง่ ต่างๆ ไว้ว่า..